a city on the northeast tip of Brazil, around 10:00 am aboard the sailboat Borandá. We used the engine to maneuver under the Newton Navarro Bridge, and a few minutes after raising the sails, we left the Potengi River heading towards the Atlantic Ocean. Little by little, we watched the strip of white sand dunes disappear, and soon after, the Forte dos Reis Magos, a famous fortress on the Natal coastline, vanished below the horizon. I observed the color of the sea change from a greenish brown to a deep blue as we ventured offshore. All that remained were the sound of the waves and the winds blowing our vessel towards the Rocas Atoll Biological Reserve. Rocas Atoll is one of the world smallest oceanic islands, and is the only one among the 439 atolls identified on the planet that is located in the South Atlantic Ocean. It sits atop a seamount of volcanic origin, with approximately 4,000 meters of altitude. However, unlike other islands, its structure is not volcanic. The entire island is of ‘biogenic’ origin, or in other words, built by living organisms. The atoll is essentially an oval reef that began to form over 5,000 years ago, growing like a crown around the mountain's peak, which today rests 25 meters below the surface. The atoll’s ring consists of two reef arches with two communication channels between a lagoon and the ocean around, and it has two sandy cays: Farol Island and Cemetério Island. And also unlike other atolls, corals are not the main builders of the Rocas’ reef structure. 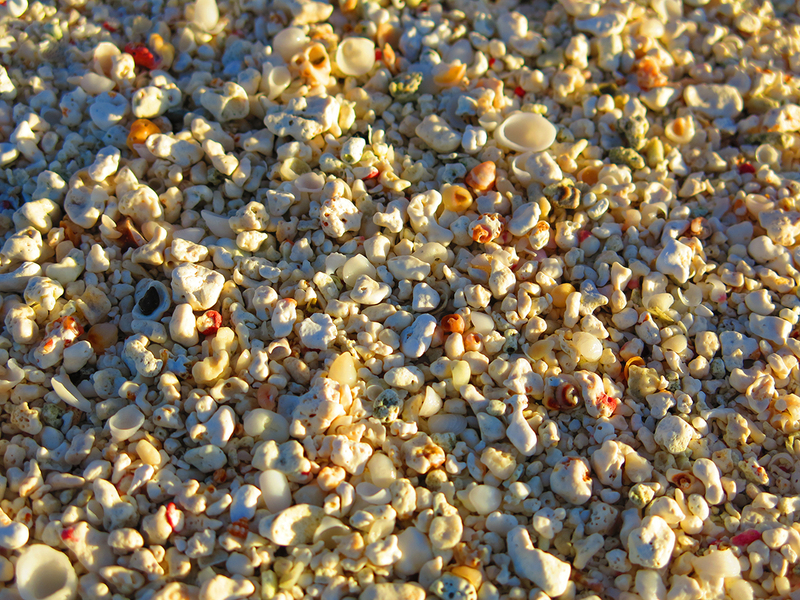 Instead it is mostly (about 70%) formed by crustose calcareous algae and to a lesser extent, by other organisms that also have a capacity to precipitate calcium carbonate from seawater, such as vermetids molluscs, foraminifera and hard corals. 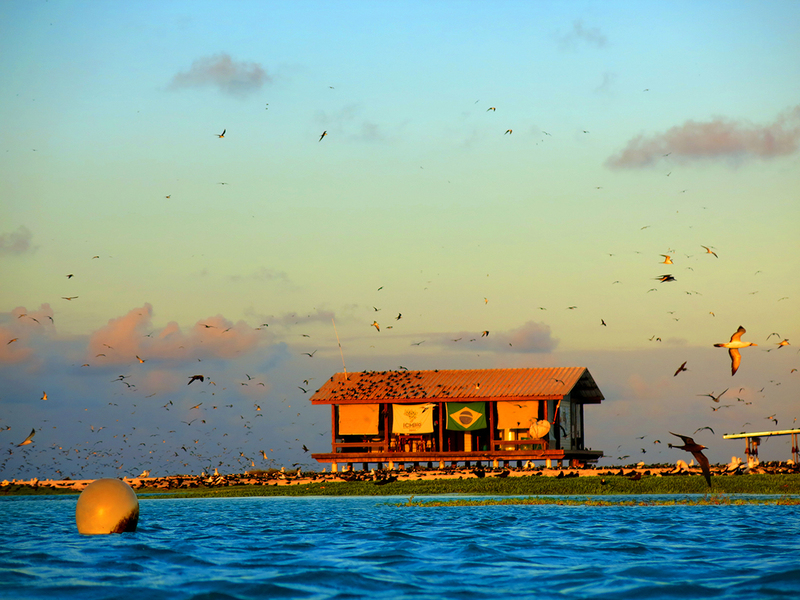 Created in 1979, Rocas Atoll Biological Reserve was the first marine conservation unit established in Brazil with the objective of total preservation of the local biodiversity. 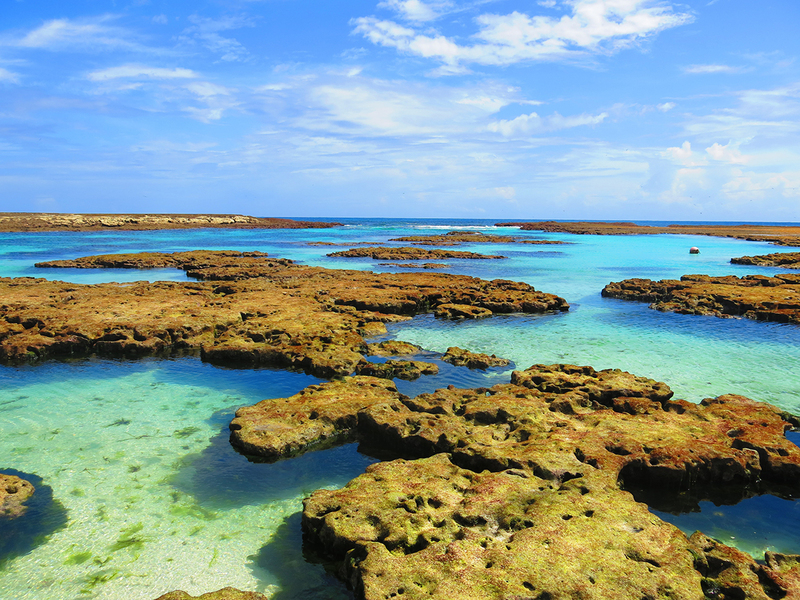 It is a refuge for sea birds, turtles, sharks and several species of fish, along with crustaceans and mollusks. Only research, monitoring and activities linked to the management of this reserve are allowed. Hunting, fishing and visitation are strictly prohibited. 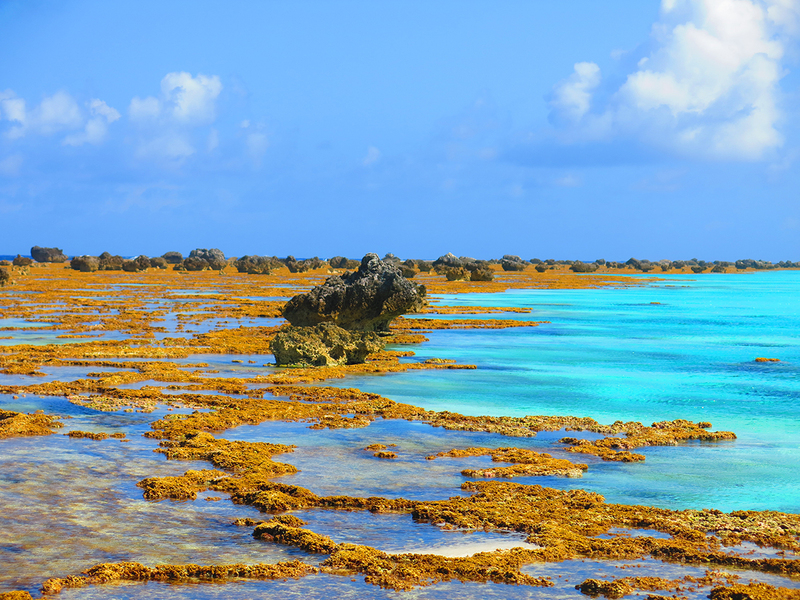 The biological reserve of Rocas Atoll is listed as a UNESCO World Heritage Site. 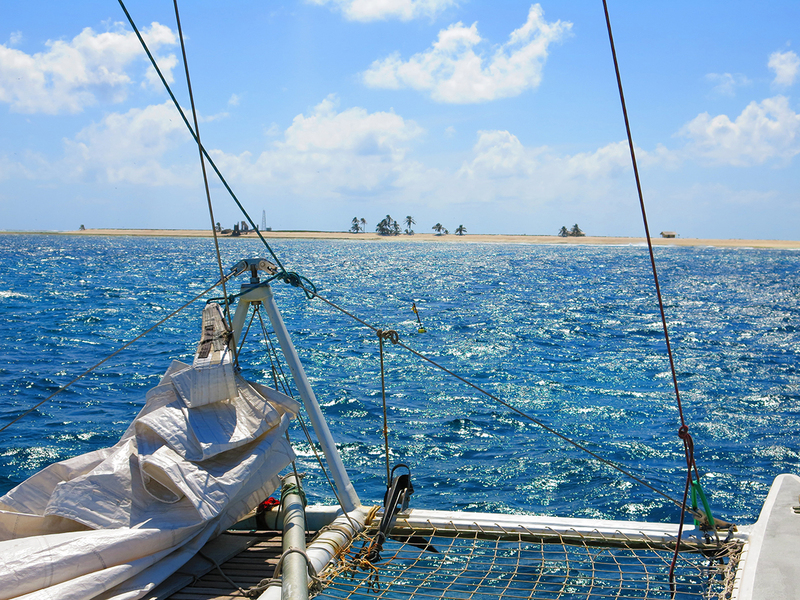 The journey to Rocas is 144 nautical miles from Natal and it takes us around 20 hours to get there. The Borandá was built exclusively for this type of trip. It is not a luxurious catamaran, but it does carry crew and passengers well, along with all the materials we will need on the island. On board Borandá for this trip was our captain, Zeca Martino, along with Jarian and Ceará as crew, and three researchers: two from the Federal University of Bahia (UFBA), and myself, from Federal University of Pernambuco (UFPE). Maurizélia Brito (Zelinha), an employee of the Chico Mendes Institute for Biodiversity Conservation (ICMBio) and head of the Biological Reserve for more than 20 years, was in charge of the expedition. These expeditions to Rocas last around 28 days and we bring to the research station all the water and food necessary for this period, in addition to the equipment for the research project activities. Each team is responsible for taking all the garbage produced during their stay on the atoll, as well as any other marine debris that the ocean currents have washed ashore. The research station can accommodate up to four researchers and a Biological Reserve employee. It has a dining area, a kitchen with stove, refrigerator and cabinets to store groceries and utensils, plus a covered deck where we keep the batteries for storing energy captured by solar panels. There is no bathroom. In addition, there is no system to catch rainwater and nor is there desalination. All the water we bring from the mainland is drank for consumption and used to cook food. 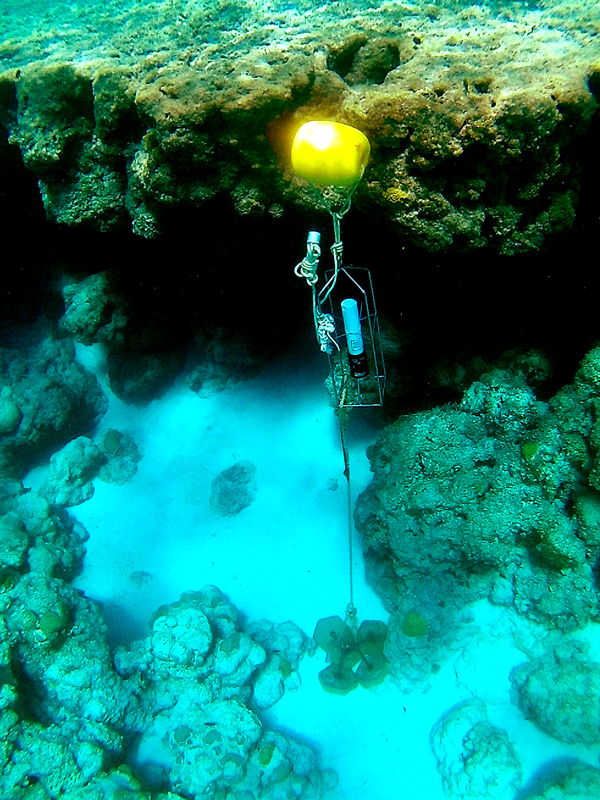 is to collect seawater in order to analyze temperature, salinity, pH and concentrations of carbon dioxide and carbonates in the atoll’s pools. Due to its location and conservation status, Rocas Atoll is considered to be an excellent natural laboratory where we can investigate the impact of climate change on a unique reef system that’s undisturbed from other factors that are observed in coastal regions such as pollution, overfishing and unorganized tourism. Around the world, reef environments are threatened by changes to the pH of the oceans caused by an increase in carbon dioxide, which itself is caused by deforestation and the burning of fossil fuels since the start of the industrial revolution. With data collected on Rocas Atoll, we can assess whether the impacts of rising sea surface temperature and ocean acidification are being observed in the atoll. Other studies carried out on the atoll have already indicated that the rise in global sea surface temperature has been causing an increase in coral diseases, such as bleaching and can lead to the death of organisms living on the atoll. Moreover, if we add the already known effects of ocean acidification and global warming to the impacts of sea level rise in reef environments, we can safely conclude that the only atoll in the South Atlantic Ocean is seriously threatened. On the way to the atoll, we listen to incredible stories of the countless crossings that Zeca, Jarian, and Ceará have made before to Rocas Atoll for more than a decade in order to transport water, food, equipment, researchers and managers. 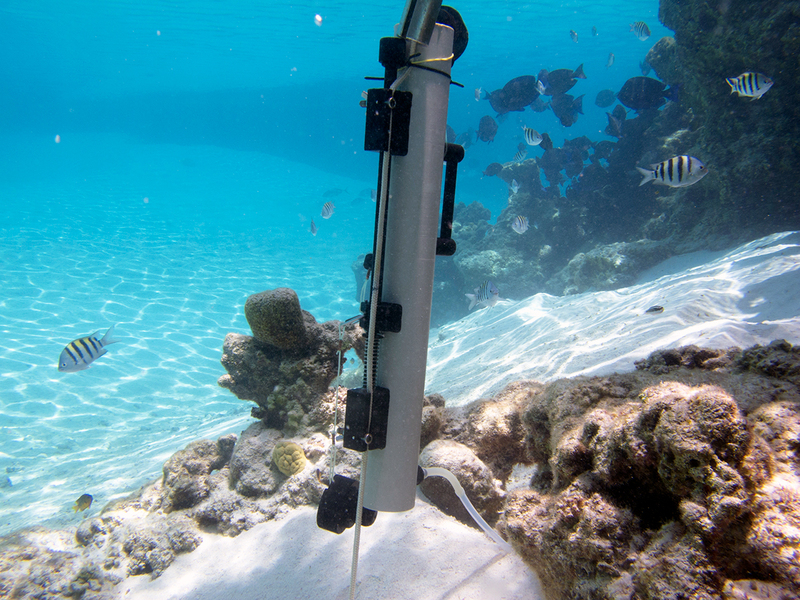 As the Biological Reserve is a fully preserved conservation unit (UC), only licensed researchers, managers and environmental analysts from the UC can participate in expeditions to the Atoll. When the sun goes down, we retire to the cabins downstairs. Sleep is quiet and easy, lulled by the rocking of the waves. I wake in the early dawn before the sun has risen. On deck I ask the captain if we are close. Zeca makes me observe and pay attention to the signs: a seabird far away in the sky, then others more following us. 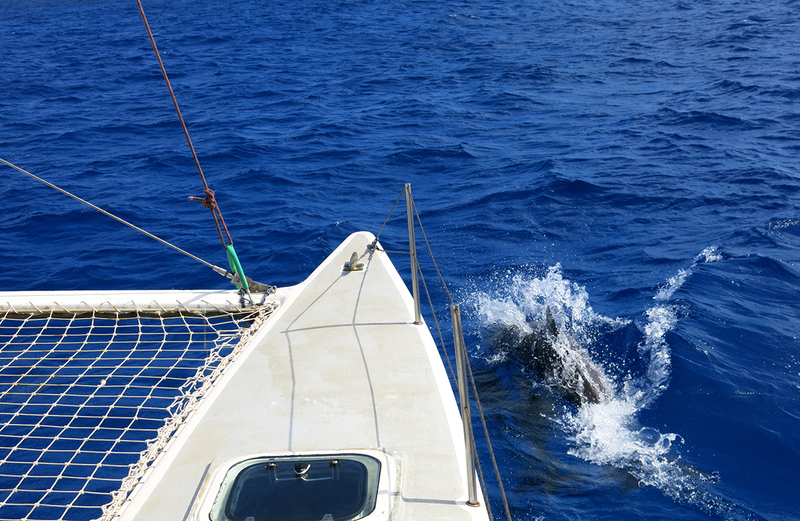 We are lucky also to see a group of dolphins swimming and jumping between waves near the bow of the boat. Only then do I see on the horizon, like a cartoon, a pile of sand, some coconut trees, a lighthouse, and then behind the ruins, comes the sun. I´ll keep this image in my memory forever. For me, it is another dream that begins to come true, as it’s the starting point of my research on the impact climate change is having on the reef builders of Rocas Atoll. on a buoy about 100 meters from the entrance of the atoll, and all the landing and exchange of teams is done in an inflatable boat with an outboard motor, during the high tide by one of the channels to the Farol Island. 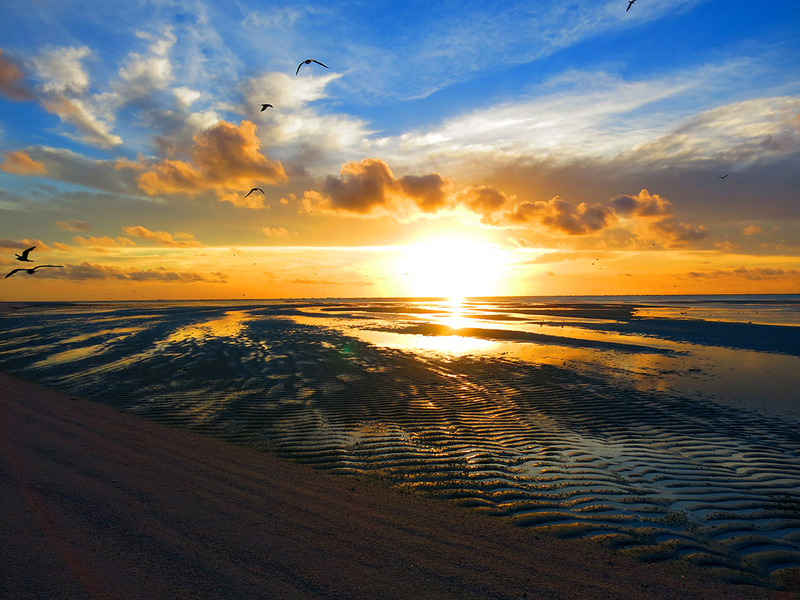 I soon perceive the sound of seabirds around the island as well as the colors of the sand and lagoon. The atoll sediment is formed solely by the remains of carbonate structures of the atoll organisms. Due to this characteristic, the sand is always white and cold and it does not concentrate the heat of the sun. We could walk barefoot without burning our feet, even at noon, but we wear shoes to avoid cutting them on sharp shells. The color of the water in the lagoon is of a celestial blue, with some shades of turquoise, and the visibility in the tidal pools and in the surrounding areas frequently passes 30 meters. 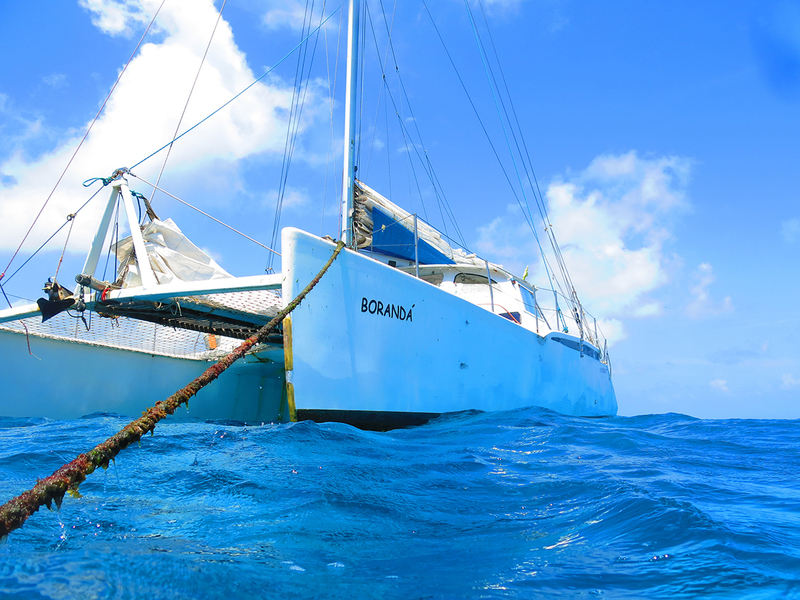 When we arrive, the previous team on Rocas Atoll, as well as the Borandá crew who took us here, begin their return trip to Natal. Time on the atoll has a different rhythm as all research activities are done during low tide when we can safely walk to the pools at the atoll rim. 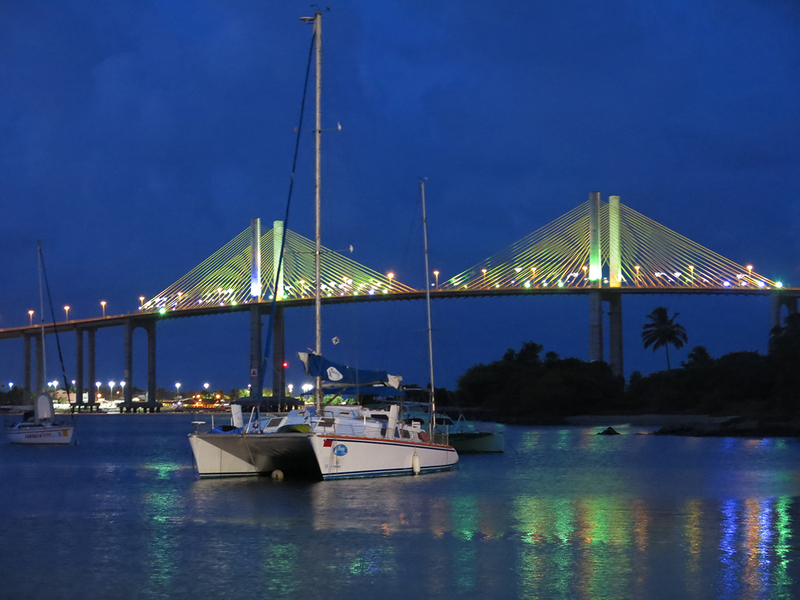 As the time of low tide changes from one day to the other, our schedule changes as well. Communication with the rest of the world is done by internet or via radio, to the Marenga’s amateur radio station in Fernando de Noronha archipelago. Observing the nature in balance around us, and trying to interfere as little as possible is our daily task. Thus, no day is the same as the other and time passes fast. When we least expect it, our 28 days are gone and we see the Borandá pointing on the horizon to take us back to the continent. Bárbara Pinheiro's research is done in conjunction with Instituto BiomaBrasil and made possible with a grant from Fundação Grupo Boticário. Learn and share information about Coral Reefs, Climate Change, Global Warming and Ocean Acidification; Use social media to raise awareness! Step one: share this article. Reduce your carbon footprint! Calculate your carbon footprint and work to reduce it or offset it. Become an advocate! Reducing carbon emissions is crucial to protecting reefs globally. Find out about existing and proposed laws, programs, and projects that could prevent carbon emission reductions. Call, email, and send letters to your elected officials to let them know you are passionate about ocean conservation. Control trash and chemical runoff from your property. 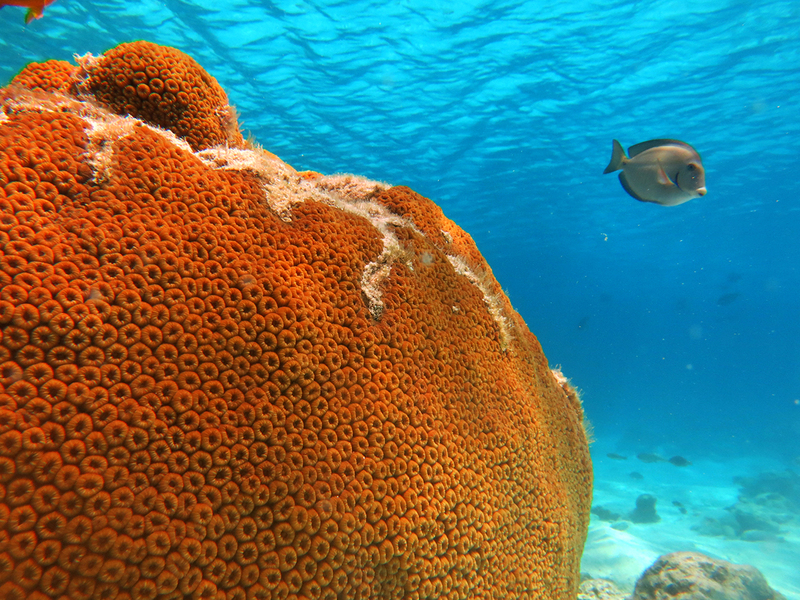 Take care when snorkeling and diving, avoid touching corals in the wild, that way you are helping keep reefs healthy!